Barbara Hastings and Barbra Pleadwell are partners at one of Hawaii’s top 10 PR firms, Hastings & Pleadwell. H&P has worked on environmental preservation, recycling, illegal dumping, tobacco control and homelessness. They maintain their commitment to education through mentorship and an internship program at the firm. To celebrate their 10th anniversary, Hastings & Pleadwell launched a campaign called 10 Good Deeds for 10 Great Years. The partners have been and are currently involved in a number of non-profit organizations and community initiatives. “We put together a series of workshops that benefited people who might otherwise not be able to pay for them and we did pro bono public relations for campaigns that might have otherwise gone without,” says Pleadwell. Helping the community is deeply embedded in the heart and soul of H&P as a company—with its principal owners actively engaging in charity. According to Hastings, community giving has been an integral part of themselves, having been exposed to a multitude of dire situations, and their business as a public relations firm. In this interview, the partners take us in to the beginnings of their PR firm, and the challenges that have had to overcome to attain their current position as one of Hawaii’s best public relations companies. They talk about mentorship, friendship, and developing and maintaining relationships with clients and the community. 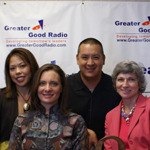 Greater Good Radio brings Barbra Hastings & Barbara Pleadwell, two female powerhouse figures in Hawaii’s PR industry. Listen now. Barbara Hastings and Barbra Pleadwell are partners at one of Hawaii’s top ten PR firms, Hastings & Pleadwell. H&P has worked on environmental preservation, recycling, illegal dumping, tobacco control and homelessness. They maintain their commitment to education through mentorship and an internship program at the firm. Please welcome to Greater Good Television, Barbara Hastings and Barbara Pleadwell. ·	Barbara Hastings and Barbra Pleadwell play an active role planning, designing, and implementing client programs. Working closely with associates on all accounts, the partners ensure that clients receive individualized attention. ·	Hastings & Pleadwell also provided communication strategies for several media outlets, including the Honolulu Star-Bulletin when it was relaunched in 2001. ·	Barbara Hastings has been a journalist and communicator for almost 40 years in Honolulu and on the Mainland. ·	Barbra Pleadwell began her professional communication career working as a journalist in Guam and Hawaii before her transition to public relations in the ’90s.